A resolution was moved in UN Security Council last month, demanding Syrian president Bashar-al-Assad to step down due to mass protests against him in Syria. The resolution was vetoed by China and Russia terming it as an intervention in internal affairs of Syria. Pakistan supported that resolution unfortunately. Syria is only pro-Iranian country left in Middle East. After the fall of Bashar-al-Assad regime Iran will be isolated and surrounded by American stooges. Pakistan’s support of this American policy is senseless as Pakistan government herself has close down the logistic supply to American and allied forces in Afghanistan. Supporting that resolution only proves that behind the curtains Pakistan government is part of American Master plan for this region and Closure of NATO supply is just a stunt to misguide people of Pakistan. 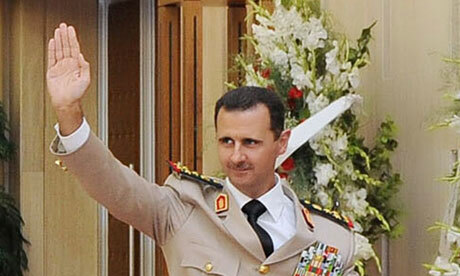 Bashar-al-Assad is the Syrian president since 2000. Before him his Father Hafiz-al-Assad ruled Syria from 1970 till his death in 2000. The protests in Syria started on 26th January last year when a civilian, Hasan Ali Akleh set himself on fire as a protest against Assad’s policies. The protests started to escalate in March and people in huge numbers turned up on streets protesting for reforms. It was part of America’s master plan to Topple Assad regime under the cover of revolution just like it did in Egypt and Libya. Initially Assad announced constitutional reforms to calm down the protestors. After gauging their mood and realizing the fact that America is after him, Assad ordered military crackdown against protestors. As a result rebels and defectors from Syrian army formed Free Syrian Army in Late July. Since then there has been brutal crackdown by forces loyal to Assad resulting in death of around 7000 to 9000 people. No doubt that what Syrian army is doing against its own people is wrong. These crackdowns should be stopped immediately. It must be realized that the rebels fighting against Syrian army are backed by America covertly. America has designed a new strategy for Middle East which is based on changing the leadership of the Arab countries. Hosni Mubarak, Muhmar Qazzafi and Zain-ul-Abideen were victims of this strategy. Now its Assad’s turn, America wants him replaced by a pro-American and anti-Iranian leader. After clearing Syria, America will concentrate on changing regime of Iran which is only Muslim country against America and Israel. In order to execute its evil plan America is using UN Security council and Muslim countries are supporting her, it’s a pity. Israel is the biggest enemy of Muslim countries in Middle East. There are only two groups which have the ability to challenge Israel militarily; Hamas and Hezbollah. Both of these groups are supported by Iran through Syria. If regime is changed in Syria then both of these groups will lose active Iranian support which will make Israel stronger. Arab league consisting of Saudi Arab and her neighbors is also with America against incumbent Syrian regime. Arab league is completely in the hands of America that’s why America doesn’t speak about dictatorships in these countries. America’s whole stance on these uprisings is Hypo critic. America supports such uprising in Libya and Syria but don’t talk about Bahrain. The uprising in Bahrain by Pro-Iran Shias was against American interests that’s why she chose to stay away from the issue. The Issue of Syria has attained global importance. UN has sent ex-Secretary General Kofi Anan as Peace Envoy to Syria. Arab League has suspended Syrian membership and sent its own observers. Everyone is highlighting Human rights violations by Syrian forces. All the International stakeholders described above, desperately want to get rid of Assad. Hezbollah Chief, Hasan Nasrullah has spoken in favor of Assad. Whereas, AL Qaeda’s new chief, Aimen-al-Zawahiri, has asked people of Syria to stand against Assad regime. Now that’s interesting America’s biggest enemy Al-Qaeda is on the same page with America on issue of Syria. This shows how deeply a web of conspiracy is weaved against Assad regime by America on persuasion of Zionist Lobby. No wonder, Syrian forces are using brutal means to crush down the uprising but it’s not happening in Syria alone. Same thing happened in Bahrain. People of Gulf countries such as Saudi Arabia, Qatar, and Jordan all have resentments against their rulers, just like Syrians have against Assad. Due to her double standards America is only creating uproar for the freedom of Syrian people and not of other Gulf countries. Muslim countries especially Pakistan should keep themselves away from the American dirty game. Pakistan has a lot internal problems to deal with, most notably Balochistan. Pakistan can’t ignore the issues within her own boundaries and support resolution demanding resignation of Bashar-al-Assad. If the Muslim rulers remain stuck with this great game, then they will pave the way for America to come down and slit their throats one day.